Over the last 20 years there has been a big focus on the science of cooking and great literature has accompanied it. This short post is about the most important rule I have learnt so far: the temperature of the water inside the food is vital. There are hundreds of lessons to be learnt about the science of cooking, but I find this one cruical because it applies to all cooking methods and almost all foods. The rule may seem simple, but don’t be deceived. Once you start focusing on internal rather than external termperature your approach to cooking adapts and your culinary knowledge inevitably broadens. The frying pan is very hot and will obviously heat up the surface of the steak it is touching. 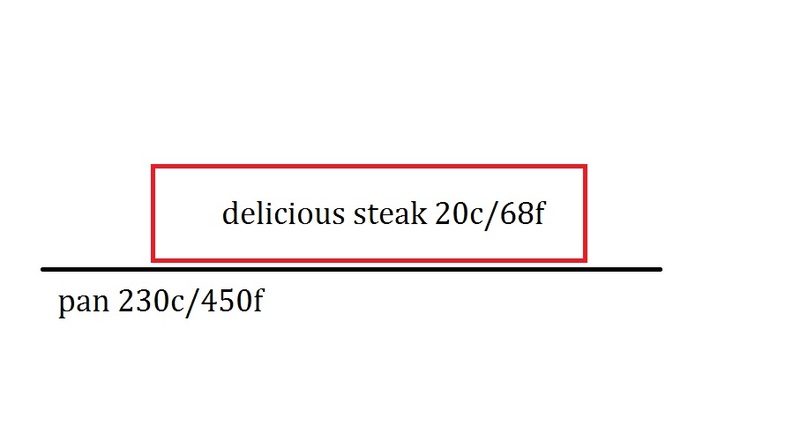 But how does that heat move through the steak, so that the middle of it (which isn’t in contact with the heat) becomes medium rare or 55C/131f? To answer that we need to know what a steak is made of. If you remember biology in school you’ll recall that all meat, fruit and vegetables are predominantly made up of water (steak is 75% water, potato is 80% water, tomato is 95% water). So how does the heat move through the steak? By heating up the water inside the steak. The water in the steak near the pan heats up first, which heats up the water around it, which heats up the water around that. Gradually the water at the centre of heats up to 55C/131f and we have a medium rare steak. In Engineering terms, the heat moves via conduction through the water particles in the food. The first thing to realise is that way of heating don’t just apply to a steak in a pan, but applies to all techniques and almost all ingredients: an external heat source warms up the water inside the food. The second thing to realise is that the water inside the food is the thing that cooks the food, not the heat around the food. The heat around the food will cook the outer layer of the steak, making the brown crispy exterior, but the majority of the steak is cooked by the water inside. Why is water temperature useful to think about? So we know that the majority of cooking is done by the water inside the food, so what? How does this help? Well now that we have this fact under our belt we can start ascertaining interesting things about water and food, which will translate into practical use in the kitchen. First thing to think about – water boils at 100C/212f. No matter how hot the surroundings are, the water inside food will never be over 100C/212f. For instance when you fry an onion, even though the pan can be 200C/392f, the temperature of the onion will not exceed 100C/212f. I find this point to be illuminating. The temperature of food will not exceed 100C/212f, even if it is in an extremely hot oven. This means that the temperature range in which food can cook is relatively small – only between 40C/104f-100C/212f. What if there is no moisture in the food? Lets continue with the onions in the pan. If the pan is very hot and is left to fry the onions, they will first leak their moisture into the pan, and eventually the moisture will boil off. Once all the moisture is gone the dry onion will then get hotter than 100C/212f and start approaching the temperature of the pan. However, apart from spices, pretty much all food has water in it and you won’t want to boil it off. The second thing to think about is how much moisture the food has in it. When you cook food it is inevitable that you will lose some of the water inside the raw ingredients. How much you lose depends on what you want to do. For instance when frying onions the moisture will leak into the pan, but the onion-y water combines with the fat to create a great flavour base for many dishes – so we want the moisture to leak. However in a steak we want to retain as much moisture as possible, so we try and leak as few juices as possible. The amount of moisture that a food should retain depends on the recipe, but an important fact to keep in mind is that food with less moisture will cook quicker. This is basic physics. If I have two pots of water, 2 litres and 1 litre, and you give them the same amount of heat, the 1 litre pot will heat up quicker. The same goes for food. If you have a raw steak and a well done steak in the same pan, the well done steak will heat quicker because it has less water inside it. The influence of the amount of water in food is best observed in baking. The main purpose of baking is to dry out ingredients with the convection of hot air. A notorious aspect of baking is that there is often a short time frame in which your food is cooked perfectly – 20 seconds too long and it’s overdone. The reason for this is to do with water content. When the water inside the ingredients gets hot enough to start evaporating, the ingredients start to lose water. This means that the food starts heating up faster as there is less water, which then makes more water evaporate, and so on. This runaway effect is the reason behind the short time frame, as once the food starts losing water it heats up quickly. The last thing to think about is that the temperature inside the food is never uniform. The side of the steak near the pan will be hotter than the middle of it. The skin of a roasting chicken will be hotter than the centre. However we often want an ingredient to be a uniform teperature throughout. A perfect medium rare steak is 55C throughout, not just the middle. A rare duck breat is 53C/127f throughout, not 53C/127f in the middle and 70C/158f at the edge. Acheiving a uniform temperature throughout the food is hard to do using conventional cooking methods, because the external heat is usually much hotter than the desired internal temperature of the food. If the pan is 200C/392f and you need the centre of the steak to be 55C/131f, there will inevitably be a bit of the steak between the pan and the middle that is above 55C/131f and therefore overdone. Getting ingredients to be the correct temperature throughout, maintaining that temperature for the correct amount of time and retaining the correct amount of moisture are three fundamental aspects of cooking that need to be mastered in order to become a good chef. And all of these are related to the temperature of the water inside the food. There are lots of practical tips that have come from thinking about the water temperature inside food. For instance you should flip a steak every 15 seconds rather than only once, because constant rotation allows the steak to graudally heat each side to 55C/131f and causes minimal leaking of moisture – resulting in a steak that is juicer and more evenly cooked than a steak flipped once. Another is that steaming or pan frying vegetables retains much more moisture than boiling them, resulting in vegetables that retain their taste. Yet another is that humidity fluctuation is the root cause of uneven baking, as humidity dictates how much moisture can evaporate and therefore the cooking time. While there are plenty of tips to get from this information, I hope that this post has also opened your mind to the science behind cooking and deepened your understanding of something that you do everyday. The science of cooking isn’t only useful for Michelin star chefs, but also for anyone who cares about what they put in their mouth. It’s definitely a great article, and it opens my eyes. However, I think some food can exceed 100C/212F because the water particles are always mixed with other elements. For instance, the blood contains iron, magnesium, and more metals. So theoretically it can heat well above the boiling water temperature. I came here from your post about eigenvectors and PCA. This post blew my mind even more than the Principle component analysis post. I in fact do care about how I cook my food, this could be the start of something beautiful. Thanks mate.